MNP-25 | 2.5″ Digits | $465. Network Time Protocol (NTP) is a networking protocol for clock synchronization between computer systems over packet-switched, variable-latency data networks. In operation since before 1985, NTP is one of the oldest Internet protocols in current use. There are multiple public time servers available from government agencies as well as public companies, that allow a “ping” time request sent to them every ~ 5 minutes. NTP accuracy is ~ 100 milliseconds. The DDS NTP master clock can be pointed to either a local time server or a public time server and use the signals to correct its own internal clock. The master has its own backup battery and keeps a very accurate time of its own. The master will send a packet of time to all the slaves and keep them synchronized to its own clock, thus saving maintenance time and keeping everyone in your organization on the same time. The master can be adjusted to a specific time zone and day light savings, and will adjust automatically with the DST changes of the selected region. Our Master clock can connect to other slave clocks via a wired connection or RF wireless connection. PoE (IEEE802.3AF STD) is gaining popularity as a cost-saving measure, allowing customers to reduce the cost of AC outlet installations . In recent years PoE has improved significantly and now allows up to 60W per port. POE can deliver power of up to 100 meters, and with some power injectors, up to 200 meters. Most POE’s will run on ~45-55v DC to allow voltage degradation over large distance, while the end device will reduce it to its required voltage of 5-24 volts. Installers will need to calculate the power required to run multiple devices on the same line and add POE injectors as required. 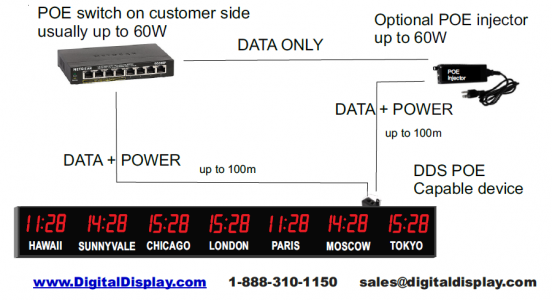 DDS displays, clocks and timers allow you to power our devices using POE enabled switch or using POE injector. Using DDS NTP synchronization also allows both low power and automated time synchronization to your network time server of your choice. In a typical installation the customer will have a POE switch or POW injector that will feed DDS devices.